Wrap up the best parts of your Thanksgiving meal into this tortilla. Smother with gravy, melt cheddar cheese over the top,add a little cranberry sauce on the side for dipping, and you've got yourself a sinfully-delicious plate of leftovers. Since this recipe uses a lot of leftover ingredients, just make sure to heat all of the leftovers to a proper temperature. Be careful not to bring the ingredients to room temperature before heating or return to the refrigerator to avoid spoiling. 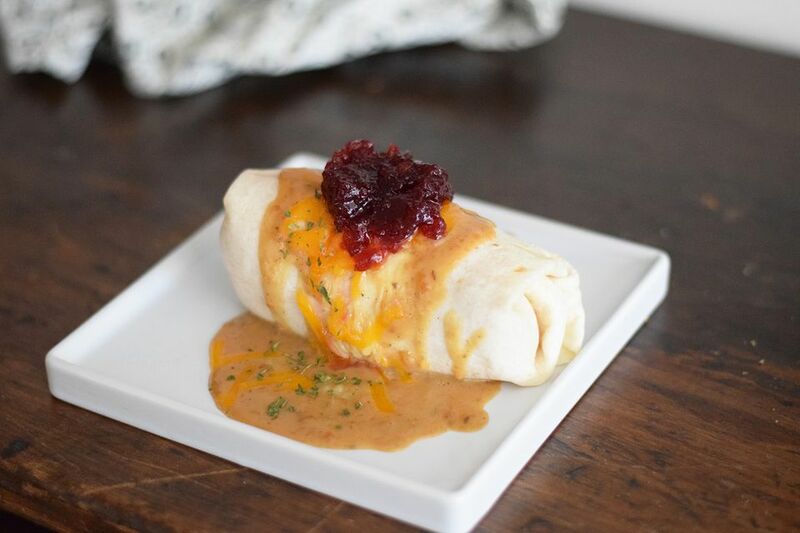 If you are trying to create this leftover burrito when you haven't recently had Thanksgiving, you can always make some modifications. Use deli turkey and whatever cranberry sauce you have on hand. As for additional add-ins, go wild and include sweet potatoes, Brussel sprouts, or any other of your favorite leftover sides from the big day. Heat the oven to broil, around 500 F. Make sure to have a rack close to the top of the oven. Quickly warm the burrito-sized tortilla in the microwave for about 20 seconds. This makes it easy to fold. Place the tortilla on a large oven-safe plate, then smear the center with sour cream. Separately, heat up the roast turkey, mashed potatoes, and leftover stuffing. You can microwave for faster results). Drop the turkey mixture onto the center of the warmed tortilla, covering the sour cream. Roll the burrito by folding the end of the burrito over the filling and then folding in the sides while rolling the tortilla. Heat the gravy in a small pot on medium-low heat until it is hot. Pour the gravy over the top of the burrito while it is on the oven proof plate. Cover as much, or as little, of the burrito that you wish. Sprinkle the top of the burrito with the shredded cheese. Place the burrito under the broiler for about 1 minute, or until the cheese is melted. Sprinkle with chopped parsley, if using. Serve with leftover cranberry sauce on the side.